REVO Husqvarna UK kicked off its first season contesting the MX2 class of the FIM Motocross World Championship with a strong showing at the MXGP of Patagonia Argentina at the weekend. 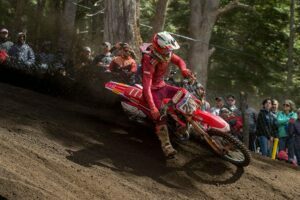 On a tough and challenging loamy track at Neuquen in the foothills of the Andes, Dylan Walsh and Alvin Östlund both showed good form as they went head-to-head with the best 250cc riders on the planet. Saturday’s qualification race was a baptism of fire for Dylan who’s starting his first full season of GPs after two years contesting the EMX250 series and he came home 23rd. Alvin, who’s entering his fourth year of world championship competition, raced to a fantastic eighth to ensure a good gate pick for Sunday’s two points-paying races. Dylan started the opening 30-minute plus two lap race the better of the pair and was at the sharp end of the action for the first two laps in 11th before losing a position. He held 12th for almost the full race duration but was pushed back a further place to 13th on the final lap. After the first lap Alvin sat in 17th and he held this position for the first half of the race before passing his way up to 14th but unfortunately he too lost a place on the final lap, crossing the line in 15th. Dylan’s start was poorer in race two and he was unable to advance any higher than 18th to end the day 15th overall. Alvin completed his first lap in 11th before slipping back to 13th which he held for much of the race. With five laps to go he moved back into the top 12 but by the flag had slipped back to 14th with his combined total earning him 14th overall, just two points ahead of his team-mate. Dylan Walsh: “I’m just feeling really disappointed. It’s been a bad weekend for me. “I struggled all weekend and put too much pressure on myself but hopefully I’ll go better now I’ve got the first round out of the way. Team principal Mark Yates: “I know Dylan in particular is feeling disappointed but he’s being very hard on himself. It’s a huge leap from EMX to MX2 and the class is stacked this season so 15th is a solid result and something that he can build on. “We know he’s got the speed and the ability and once he settles into the class and gains more experience at this level I’m confident that he’s easily got what it takes to run comfortably inside the top 10. “Alvin also had a solid weekend and after spending much of last year out injured he’s done well to come back so strongly.